I'm going to a new accountant this year. He seems very regimented in his process and I haven't even met him. Despite being more collected about my receipts and information this year I had to take a couple of hours today to line it up the way the new guy asked. Part of my new organizational format this year allowed for me to keep receipts for the pets. It's not tax deductible by any stretch of the imagination but I was interested in what I spend yearly on these guys. I remember an internet meme from a while ago estimating annual dog food expenses at $200. That just didn't sound right to me but without the proof I couldn't say for sure. Here are my 2013 results for three pets. 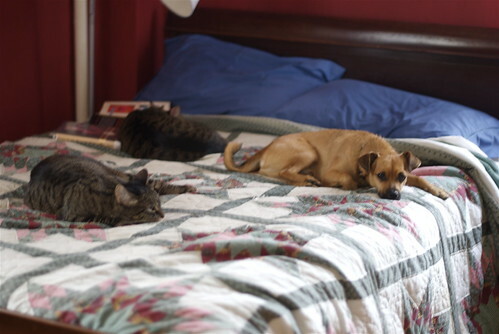 It's 2 indoor cats and one indoor-outdoor dog. Dog is 5. Cats are 13. One cat has chronic health problems. The dog has non-debilitating allergies. It's also probably not every single thing I've bought for them but it's close. Keep in mind that treats are folded into three of those categories somewhere and that I choose to buy treats (and food) that boost health and immunity in my medically somewhat fragile pets. I also choose a dog walker over paper training or dog daycare. I guess I could be spendier/crazier but I also feel like I'm doing what's best for them and that's not crazy at all. What do you think? I vote for NOT CRAZY! I have 2 cats, and I feel fortunate that I'm able to provide them both with what they need--and they pay it back with their love and attention every day. To me, it all comes down to--your money, your choices, right? Pets rely on us to care for them the best that we can. We are their world and it is a big responsibility to give them all that we can. I don't have children so I do all I can for my furbaby. She gives me so much love so I owe her the best life I can give her. I don't think that's crazy at all and kudos to you for taking such good care of your little ones. i agree with both of my fellow commenters: taking care of your pets isn't crazy. it's our responsibility as their caretakers to give them the best life possible. sure, this might mean we spend more than some folks deem normal or acceptable, but then again most of those folks have diabetic and overweight animals with almost no training whatsoever.